Happy January! Let’s not talk about the New Year’s R-word because it doesn’t fly in my life. Let’s instead focus on what I’d like to get into this year. XP! I would like to do one thing everyday that pushes me further along the experience bar of craftiness. It doesn’t have to be big, but I need to do it for at least 15 minutes. Why 15 minutes? My lunch break is at least 30 minutes long, so I can absolutely devote half of my free time to something I love. Weekends have been easy, but on days that aren’t so, I’ve been knitting and organizing my fabric stash to squeeze in time before midnight. Things! All of them. For almost a year, I’ve been employing the idea of learning a new skill with each project. It started with my Zelda costume when I made basic craft foam armor. Near the end of the year, my Batgirl outfit gave me some time with couched designs (which I plan to use again soon). Every new thing that I learn makes me all kinds of giddy and ready to start a new project. Travel! I’m shy. No, really, I am. 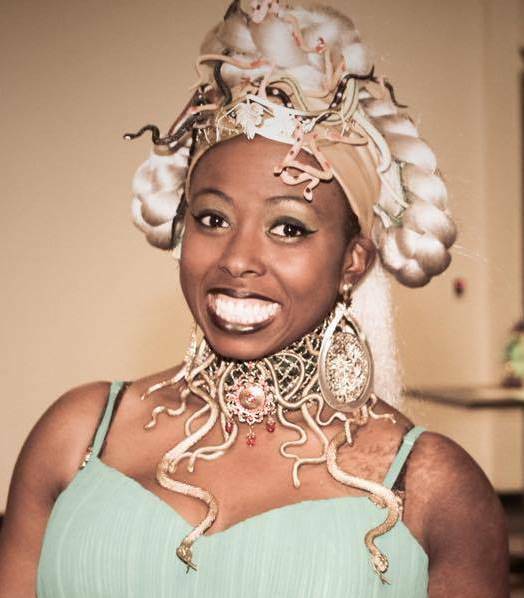 Last year, I took a huge leap by going to the Steampunk World’s Fair by myself. I had friends who were going, but I drove up on my own, and I had my own room, and I had to be a big girl. I wandered around alone, mostly to shop, and ended up having a fabulous time. I didn’t have to worry about making sure that anyone else was happy, which made it easy to get a lot out of the event. This year, I’m going to my first costuming conference, I plan to add a fairy faire to the family schedule, and I’ll be dressing in costume for a comic-con–I already have my outfits planned! The first month has been pretty great for all of the above, or at least getting my ideas down on paper. 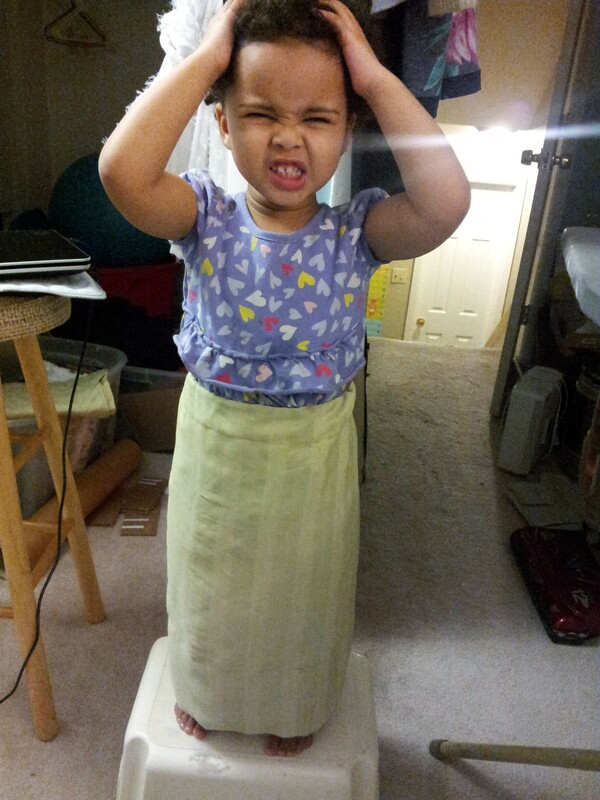 I loaned a toddler friend one of The Tyrant’s old dresses and made a cute little underskirt to go with it. It’s a simple drawstring-gathered skirt with a generous hem for growth. The Tyrant isn’t a fan of modeling half of an ensemble. My family and I went to The Walters Museum in Baltimore to tour the exhibit, Revealing the African Presence in Renaissance Europe, which blew my mind just seeing art that I’ve been crazy after for so long. If you’re interested, most of the pieces will be at Princeton through spring. 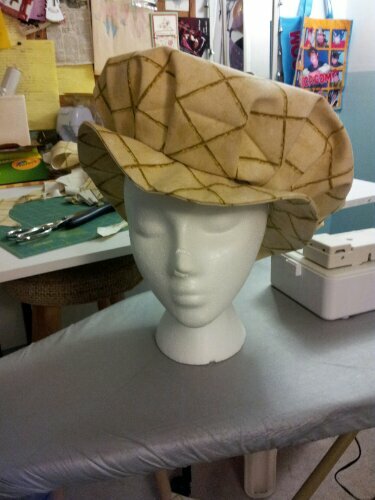 I made a floppy hat for my grandmother, who says that she may come to faire with us this year! Funny thing about the hat: she plans on wearing it to church. It’s based on the Sempstress.org’s pattern, but I pleated out from the center in opposite directions since I can never get that part right. For a last minute performance, I made a hip skirt out of a chiffon poncho and a belt out of curtain ties. 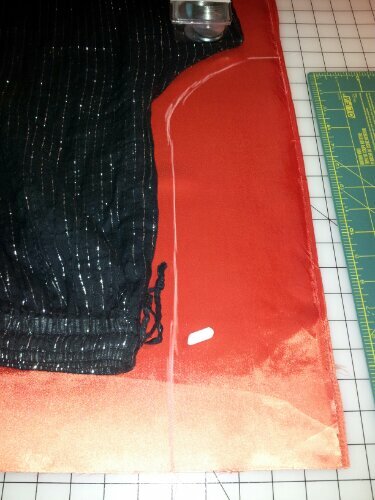 I slit the neck opening of the poncho just enough to get it over my hips (about four inches), then I used a pearls & sequins foot to attach a length of cording around the whole opening with enough to tie. For the belt, I pulled the loops off of the ends of the braiding, measured and marked the two curtain ties to my front and back, stitched down the ends, and attached satin ribbon to each end. 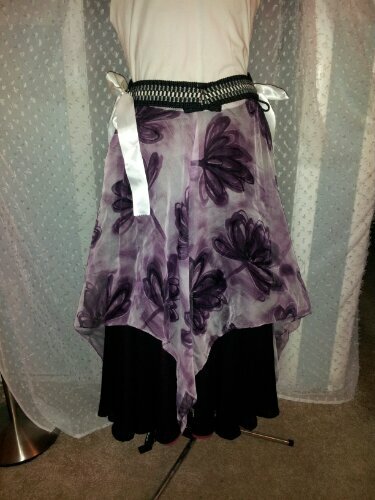 I wore this for a fusion improv with black Melodias and a black sleeveless, open back choli. I constructed another Urban Threads tiny top hat for a troupe-mate (which has prompted the director to request them for everyone). That puts my TTH level at 3; maybe I’ll get a badge when I hit five–it’s not a quick project. 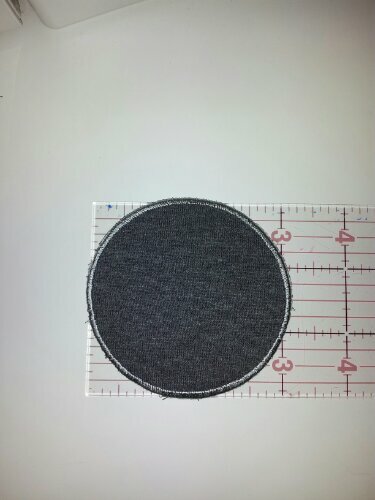 I frankensteined a circle patch together for a performer friend–a big triumph because I had to guess at the circle size that I told the machine to make and then cross my fingers that it was going to make a tight zig-zag stitch the same size. She plays parts in the local Rocky Horror Picture Show, and this patch will be painted to make its way onto Eddie’s jacket. 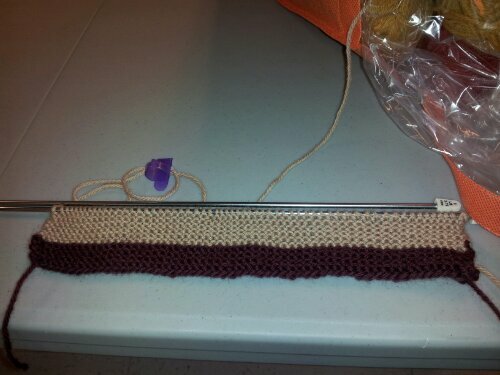 I finally started the 4th Doctor’s scarf after a few years of promising another friend that I’d make it. I did my test swatch with a fancy pair of wood needles from Knit Picks, but it turns out that I needed a size down, so I had to use my existing metal ones. I definitely prefer the wood, but I don’t want to upset the gauge so I might just deal with it. 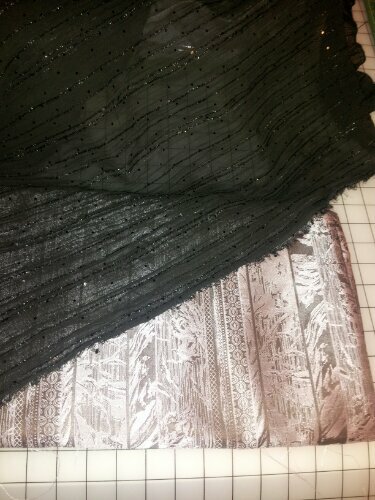 And for the first serious project of the year, I started my costume for the biggest solo of my budding dance life. The first part of the outfit is harem pants/pantaloons–the voluminous ones, which I prefer over Melodias and skirts. 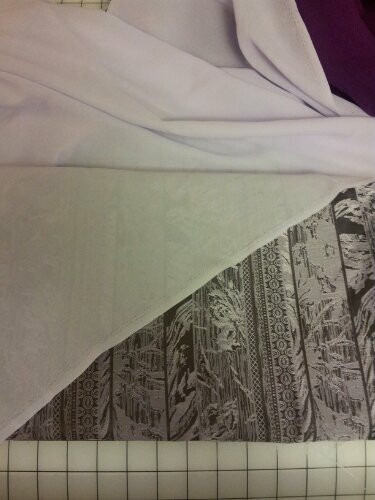 Since I already have a normal pair in the right size, I laid them out on some satin-ish fabric (nearly the same drape as my final fabric) and cut them extra wide with seam allowances. The test pair turned out ‘okay’. I need to decrease the length in the seat and add length in the legs (said me for the first time ever). The two inch elastic that I’d planned to use did not play well with the fabric, which frays like no one’s business, so I zig-zagged the waist casing and replaced the elastic with 1-1/2 inch twill tape. 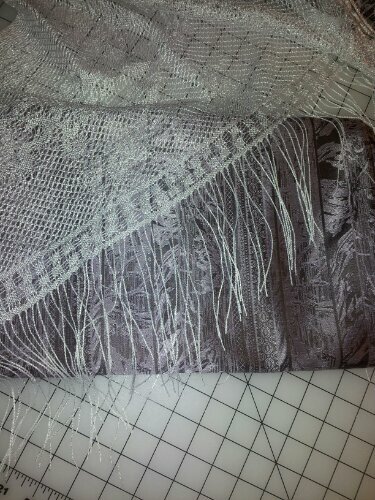 It sits much better on my hips and reduces the stress on the fabric. Now, I have a pair of bright-@$$-orange dance pants, and I’m in love with them. Because I want to get this absolutely right, I’m going to do at least one more test pair in a black and green striped fabric that I won’t be using for anything any time soon…because it’s black and green striped fabric. I’m not judging, I’m just saying. 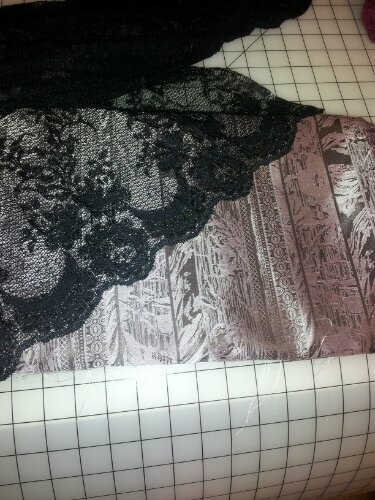 After I get the pants right, I’ll move on to the bra, style to be determined. 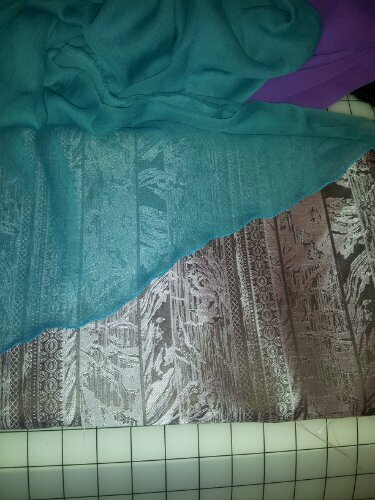 And the biggest challenge on the horizon looks to be choosing an overskirt color to go with my main fabric. I welcome suggestions on this. 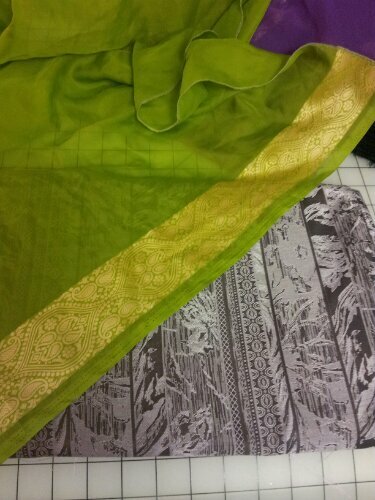 I don’t even know what color my primary fabric is; “shiny” doesn’t count. I have a bit of time before I need to decide on the skirt (short, with a little twirl to it), but between that and finding embellishment for the bra and belt, March is coming too quickly. 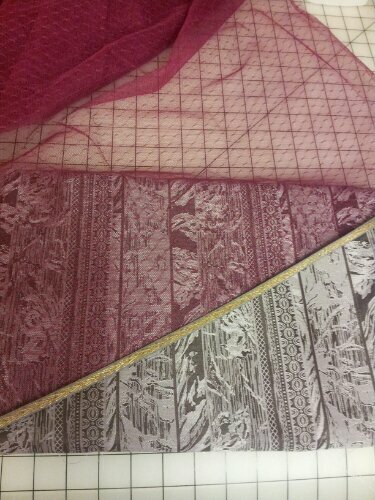 I keep telling myself that I will not stray outside of my fabric stash until I manage to use or sell half of it…yeah, I know…blasphemy. I would need to hire an assistant just to photograph and list half of it. For anyone looking for an update on my sewing room progress, I’ve closed six storage bins of wrapped/folded fabric. Woohoo! Unfortunately, I’m now down to one yard or less remnants and scraps that are taking up a serious amount of square footage in my room. I want to throw them all out, but we all know that’s not going to happen. I’ve been scouring Pinterest for ideas that I’ll follow through with, but only fabric coiled bowls and foot rests seem like projects I’d finish when I’m done with my scheduled costumes. 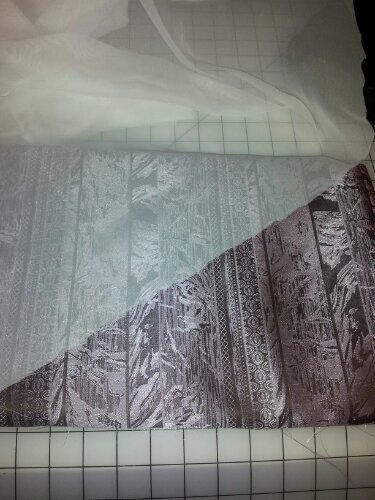 I also entertained the notion of getting a fabric cutting roller-machine-a-ma-jig to cut and sell quilting bundles. I love any project that gets me a new toy, so we’ll see. It went quickly, but this was a great and productive month! I look forward to more like this.